Letras Latinas Blog: The Letras Latinas Writers Initiative: last year, this year. The Letras Latinas Writers Initiative: last year, this year. Last April (2014), the Letras Latinas Writers Initiative held its second gathering, during which MFA candidates from various programs spent a weekend at Notre Dame. What follows are some testimonios (see below). What a weekend it was! It was refreshing to listen to the talks that Laurie Anne Guerrero, Diego Baez, Orlando Menes, and Francisco X. Alarcon gave. I walked away from each talk inspired and reaching for my notebook and pencil. Duende was very much walking with us this weekend. he time shared with Lauro, Elizabeth, Javier, Lynda, Jonathan, and Suzie was like chilling at home with people you’ve known since elementary. So second-nature, even for those I had just met for the first time. It was familia, no doubt. Spaces like this one are so necessary given the low numbers of Latin@s in MFA programs. Many times there are conversations that can only be unloaded in spaces like this. I’ve got to say that one of my favorite things was editing and reading poems late into the night with Elizabeth and Javier. Thank you all for a great weekend. Lovely individuals! Brilliant poets! This weekend...my heart needed these moments so terribly. Meeting new poets Elizabeth Acevedo, Javier Zamora, Laurie Ann Guerrero, Francisco X Alarcon, and spending time with old friends like Lauro Vasquez, Francisco Aragón, Orlando Menes, Nayelly Barrios, Jonathan Diaz, Suzi Garcia, and Diego Báez was a highlight of my year. We had a great time sharing each other’s work, talking about the joys and challenges of being a writing student, watching Garcia Lorca’s Blood Wedding and discussing the production during a lovely reception, among other fun activities. In these gatherings, one feels right at home, as if you’ve known these poets for years. I found it so inspiring to learn from them and to listen to their stories and their amazing work. The Roundtable gatherings are a great opportunity for us to pause from our hectic lives and remember why we do what we do. Spending the weekend with Letras Latinas was invigorating. We were poets from all over, with many different heritages, experiences, and aesthetics among us, but we came together for fellowship and encouragement. It was amazing to not just make new friends, but to share resources, to commiserate, and to learn from some of the most respected and exciting poets writing today. Letras Latinas took us away from the world and reminded us of where we're from, as well as where we can go. The time I spent at Notre Dame with fellow MFA poets, Elizabeth Acevedo, Nayelly Barrios, Jonathan Diaz, Suzi Garcia, and Lynda Letona, was nothing short of a blessing. It was an intimate opportunity to write and revise poems, knowing that their feedback was one given with all the sentiment of familia. It also shed light into the privilege I have at NYU of having other writers of color in my workshops. Not that numbers matter, but I believed the numbers at NYU were low! Which made me realize the problems of the MFA world; there simply are not enough brown voices in workshops and that’s a problem! Therefore, more than ever, gatherings like this one need to occur much much much more often. The words of MFA grads, Diego Báez and Lauro Vazquez were more than valuable as they shed light into what to expect in the real world after graduating with an MFA. The retreat didn’t stop there and the famila aspect expanded by spending time with steamed poets, Francisco X Alarcón, Francisco Aragón, Laurie Ann Guerrero, and Orlando Menes. Their wisdom is never quantifiable and to share avid discussions and everyday conversations with them was a privilege. Thank you Letras Latinas and Notre Dame for providing a little breathing room as the MFA semester winded down. I was so happy that the Andres Montoya Poetry Prize reading overlapped with the young writer's initiative at Notre Dame. Not only was I able to have moments of confirmation & encouragement with one of my own mentors, Francisco X. Alarcon, but my experience as a student, writer, and educator allowed for some great conversations with the MFA students. What is most endearing and inspiring about these poets is their commitment to each other and to the fight to raise Latino/a voices in the US. Their work on the page & in the community--as well as their determination-- confirm that change is being made all over the country. The older generation of Latino/a poets has paved a road that allows us, and those who come after us, to keep building upon those roads, making them wider, more accessible to future generations. We are in a time of great change; I'm proud and honored to be among those involved in the work. The Letras Latinas weekend retreat was absolutely inspiring. To share a space with other poets who understood what my MFA experience was like, who shared the same insecurities while simultaneously encouraging my ambitions, who allowed my full person and experience to be in the conversation of my writing and poetic goals, was one of the most transformational moments I've ever had. Seeing the different stages of Latino writing from the MFA students, who like me are working on their thesis and potential first book, to Laurie Ann Guerrerro who is working on her second, to Francisco X. Alarcon who has published many books and is engaging with so many different aspects of writing, opened my eyes to the potential of my writing and career. This year’s Letras Latinas Writers Initiative gathering is taking place at Arizona State University this weekend. 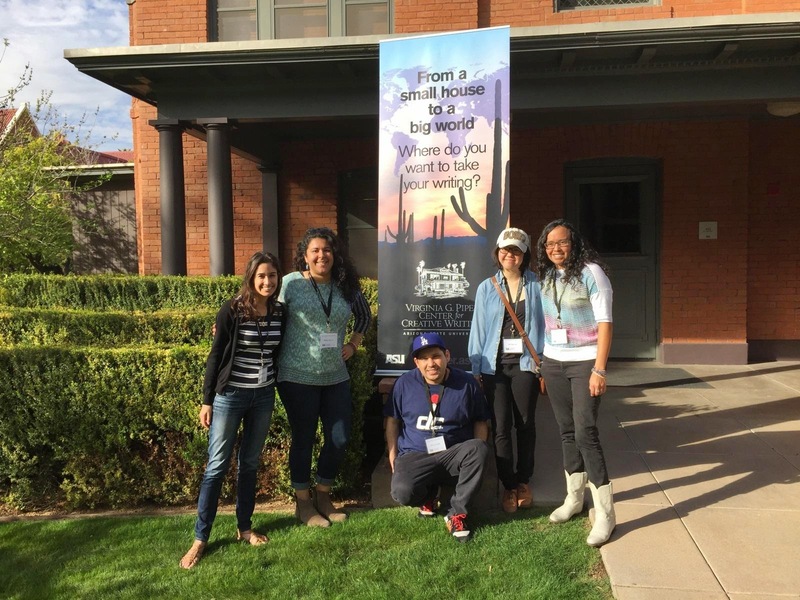 MFA candidates from four programs are partaking in Desert Nights, Rising Stars Writing Conference through the generous support of the Virginia G. Piper Center. In addition to the time they will be spending at the conference, this year’s cohort will also take part in a conversation on Latina/o Poetics with Alberto “Tito” Rios; and a craft talk, “The Poetics of Witness,” presented by Cynthia Hogue—all sponsored by the Maxine and Jonathan Marshall Chair in Modern and Contemporary Poetry and the Creative Writing Program. Outside these activities, participants will also have the opportunity to have a special dinner with Rigoberto Gonzalez, DNRS faculty, and to visit the Phoenix Art Museum.